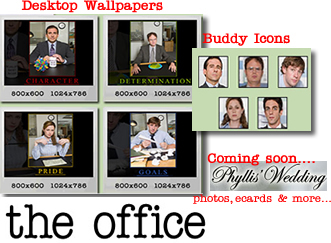 Just wanted to let everyone know that NBC.com has just added a few new Office-themed wallpapers and AIM buddy Icons to their website. Click here (or on the image below) to make your computer more ‘Office’ friendly. P.S. Did you notice the little tease about Phyllis’s wedding? Is it wrong that I am getting SUPER excited that they are going to be issuing ecards and photos from that episode? I wonder if something BIG happens…besides the marriage of Phyllis and Bob Vance, Vance Refrigeration. No doubt about it GMMR. I also believe Phyllis’ Wedding is going to have some glorious moments. Until Verizon starts carrying the Office ringtone, I’m pouting in the corner. How did you get The Office theme GMMR? I don’t care how much it costs. I want it!! i wonder if Karen dumps Jim at the wedding or somthing happens in a broom closet….. I can’t wait a week for a new episode!!!!! I apologize. I think I could use the office ring tone because I have a TREO. A Verizon Treo but it’s different than other Verizon phones. Thursday Morning, there’s a picture of the wedding in US Weekly??? How cool is that? My issue didn’t come in today. I usually get it on Saturdays or Sundays…Can’t wait!! !